The Bike Index would like to welcome our newest bike registration partners - webikeeugene.org, bikecleveland.org, bikingtoronto.com, and bikinginla.com! All four of these awesomely local bike-centric blogs are now running the Bike Index WordPress plugin, which enables blogs to run local bike registries and better serve their local riders. This amazing plugin lets any Wordpress blogs offer things like free bike registration, hyper-local stolen bike registration, and hyper-local -- and searchable stolen bike listings. 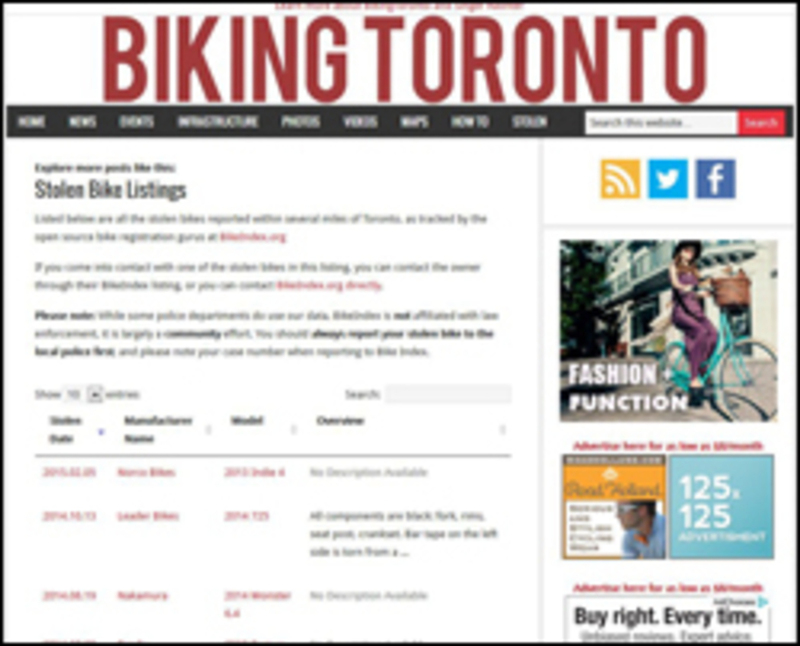 The blogs get to keep the traffic and give their users easy-to-use tools to register bikes (and search for stolen bikes) - while letting us handle the heavy lifting on the backend. These newest partners join our rapidly growing roster of partners such as bikeportland.org, gobikebuffalo.org, seattlebikeblog.com, tucsonvelo.org, and indycog.org. Many years ago, this plugin began with bikeportland.org, where we learned how amazing it is to combine local bike blogs with our powerful stolen bike listings. And it works! Since its inception in 2009, bikeportland.org has registered over 5,000 stolen bikes alone - and the bikeportland.org stolen bike listings have become a fixture with many local shops. This has lead to some truly amazing recoveries. Thanks to partners and friends like these, the Bike Index has recovered, registered, and protected over 40,000 bikes thanks to these partners, and we look forward to rolling out more in the future. Onward!